Pesto is a sauce above all! Yes sauces are so important in cooking. They add to a dish and then they may be an essential part of that dish. But what is a sauce? I am not going to say what a great sauce should be. Still Pesto is a sauce! Remember that initially Pesto was created by beating down Basil leaves using a pestle. A kind of creamy consistency was produced. You can say’But isn’t this a strange way to make a sauce! By beating Basil Leaves with a pestle.’ Remember that the basil leaves are put in a bowl with salt and garlic and then crushed…a type of sauce is formed. . a creamy texture. It is fascinating how the basil leaves are so important to this sauce – Pesto! After this, pine nuts are inserted and then finally grated cheese and some olive oil. What are the main ingredients for Pesto? Note that tomato pesto is a significant sauce and it is a type of pesto. But here there’s Pesto in its original form. Then you will find pine nuts then grated cheese. 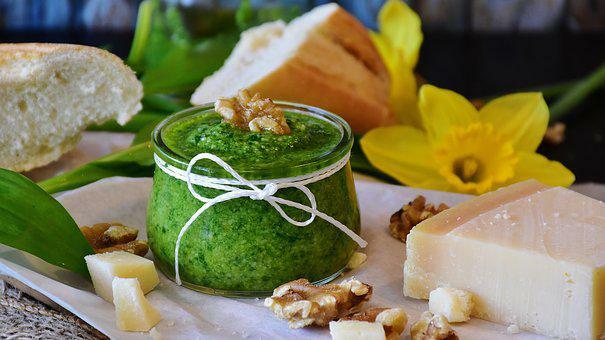 There is something so natural about beating the basil leaves down and adding garlic and sauce to create that creamy consistency and it is this creamy consistency which is the base of the Pesto!